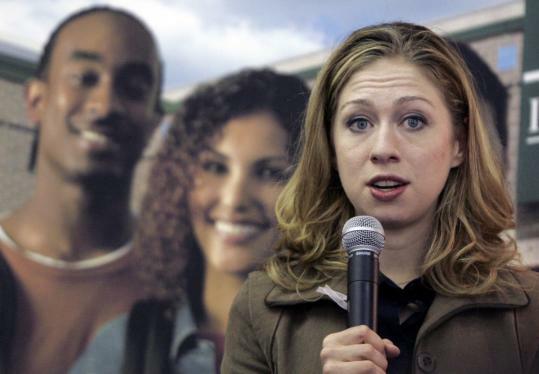 INDIANAPOLIS - Chelsea Clinton is spending long days on the campaign trail telling college crowds about her mother's positions on issues, including healthcare, student loan costs, the Darfur crisis, and gay rights. But there is one subject she will not discuss: "The Other Woman." At least three times in the past two weeks, the former and possible future first daughter has been asked about the Monica Lewinsky scandal's influence on the presidential campaign of her mother, Hillary Clinton. When a student at Butler University in Indianapolis first asked the question on March 25, Chelsea Clinton drew applause and gave a short response that ended with: "I do not think that is any of your business." Asked again at North Carolina State University in Raleigh last week, she said: "I think that is something that is personal to my family. I'm sure there are things that are personal to your family that you don't think are anyone else's business, either. But also on a larger point, I don't think you should vote for or against my mother because of my father." On Monday, many in the crowd at Purdue University in West Lafayette, Ind., booed at a question about the impeachment proceedings against President Clinton, which arose from allegations he lied under oath and obstructed justice to cover up the Oval Office affair with Lewinsky. Chelsea Clinton, 28, quickly summed up her position: "If that's what you want to vote on, that's what you should vote on. But I think there are other people [who are] going to vote on things like healthcare and economics." Amanda Morris, president of Purdue's Students for Hillary chapter, said that she approved of the audience reaction and how Clinton is responding. She also expects the question might keep coming up. "I really think it has gotten to the point where it is the attention thing," said Morris, a sophomore from Kokomo, Ind. "At first, maybe that student really wanted to know what she thought about it. But by now it's, 'Oh, that person got attention for it, I'm going to keep asking.' "
Philippe Reines, a Clinton campaign spokesman, said Chelsea Clinton has made 99 campus stops and that the Lewinsky matter is not a burning issue. "She has been asked less than a handful of times, and she has been clear on where her lines of privacy are," he said. Todd Domke So, who has the media edge?